Jason Hastings (foreground) follows his putt on the ninth hole at Wild Quail CC during the Vikings’ opening match with Caesar Rodney. Teammate Brett Hertel watches from behind, because his putt was on the same line. The Cape Henlopen High School golf team lost a close match in its season opener with the Caesar Rodney Riders on Tuesday, March 22, 174-177. Most of the golfers seemed to have trouble adjusting to the cold weather on the front nine at Wild Quail Golf & Country Club near Camden, but with good reason. Although it was a beautifully sunny day, the wind chill took the low 40s temperature well into freezing, and the 15-20 knot breezes played havoc with several shots. Under these conditions, it was little wonder that both team scores were relatively high. On the other hand, two golfers didn’t seem to mind the chill. 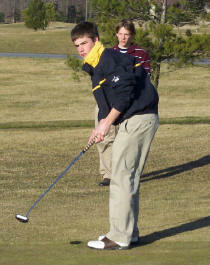 John Purple shared medalist honors with Caesar Rodney’s Jay Whitby with a pair of 3-over 39s. The junior Viking parred the first four holes, bogeyed the next two, and split two more pars with a bogey on the 8th hole. The Vikings’ next best score was Brett Hertel’s 44. The senior was none too pleased: “I was all over the place.” His round included two up-and-downs for pars on the 2nd and 4th holes, hitting a building and chipping from behind a tree for a double on the 8th, and a flyer over the 5th green, for a bogey on the long par 5. He also made a birdie on the 6th, however, rolling in a 15-foot downhill putt. On the last hole the senior showed some great recovery skills. His approach shot landed 25 yards right of the hole, on the downslope in a large greenside bunker. Lee calmly set his feet firmly in the sand and took a lazy swing. The ball sailed half-way to the hole, rolling to a stop 12 feet directly below the pin. The tiny knot of players, parents, and coaches along the back of the green spontaneously broke into applause. Apparently the positive feedback unnerved him. Lee just missed the par putt. Senior Kurt Stephens admitted he was nervous when he started his very first varsity match. Things didn’t improve much for him thereafter, as he scored a disappointing 54. For example, his approach shot on the 9th hole landed in the bunker right of the green, but his blast out of the trap sailed over the green to a sloping hillside 20 yards to the left of the green. Stephens’ next shot landed in the left side bunker. He managed to put his next shot on the green, and he putted out. I knew just how he felt. Head coach Corey Groll was disappointed, especially after all the practice the team had put in during the cold days leading up to this first match. Let’s hope the improving weather also improves the team’s prospects.